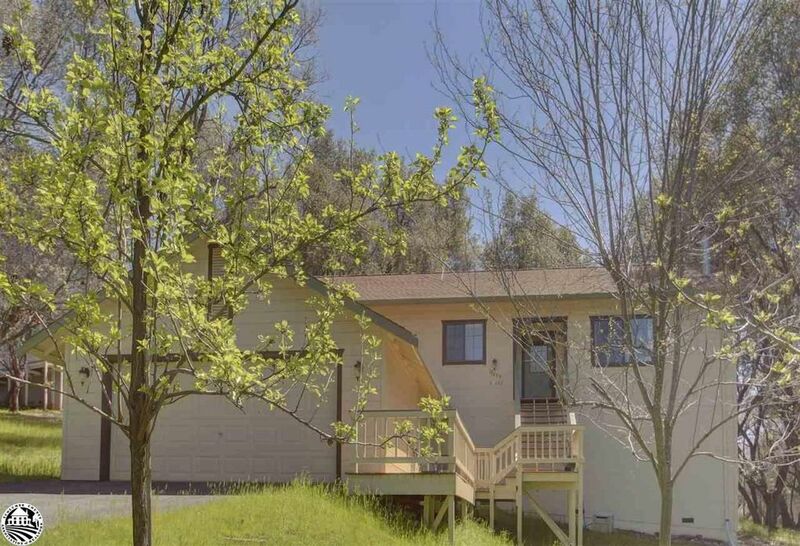 RAISED RANCHER IN PICTURESQUE WOODED SETTING This well maintained home has a great room floor plan with vaulted ceilings and the living room area includes a wood stove on a floor to ceiling brick hearth. The design is conducive to entertaining with kitchen island seating, great counter space for food prep and a slider off the dining area opening to a spacious back deck. From every window you enjoy the beautiful setting, with a collection of bird houses suspended from the many trees. A small seasonal creek meanders between this home and the adjacent property. The 1436 sq ft floor plan includes a total of 3 bedrooms and two baths described as follows; 2 guest bedrooms, a guest bathroom with tub/shower combo and a master suite with a walk-in closet and spacious master bath featuring a large soaking tub with glass shower surround. A separate laundry room includes a vanity with sink and washer/dryer included. This home was designed with great storage throughout. The attached two car garage is over sized, with a workbench in the back and an overhead storage space. The newer front deck and roof. Most furniture available.